Personalized Tours may be scheduled if you are unable to attend a Discovery Day. Please contact the Admission Office at 410-531-7347 or admission@glenelg.org to arrange a tour at your convenience. Want to see our students in action? Throughout the year students are actively performing in musicals, concerts, sporting events, STEAM fairs, and more. These events are all open to prospective families. Please view our schedule of events and our athletic schedule for specific dates, times and locations. Discovery Days are an opportunity to show you around our beautiful campus, give you tours of the schools, and introduce you to the learning environment that will shape your child’s future. They are held on regular school days, providing our guests with a genuine look at the student experience. While primarily for parents, children are also welcome to attend. The day begins promptly at 9:00 a.m., with check-in, refreshments, and a welcome from our Head of School, Admission Director, and current students. Touring groups are organized by division – Little Dragons, Lower, Middle, and Upper. 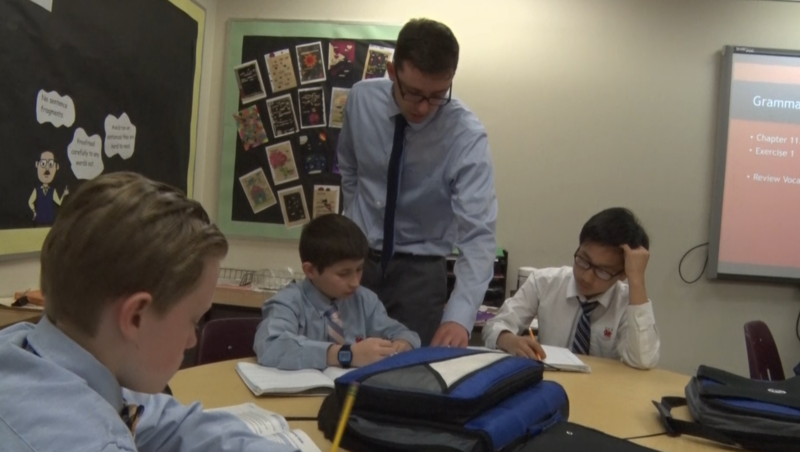 School administrators lead the Little Dragon and Lower School groups, while students conduct Middle and Upper School tours. Initial tours usually conclude around 10:30 a.m., but you are welcome to stay for a tour of another school division. Find a Discovery Day that works for you! To personalize your experience, registration is recommended but walk-ins are always welcome. Our final Discovery Day for the 2018-2019 school year was held on April 10, 2019. If you are interested in the 2020-2021 academic year, we encourage you to call the Admission Office to schedule a personal tour at your convenience. Looking ahead to the 2020-2021 year, please note the following dates for our Discovery Days. Registration for the fall events will open in August 2019. Please complete our online inquiry form. You will receive an email in August with instructions on how to register for the most convenient date. If you have any questions, please contact admission@glenelg.org or 410-531-7347. If you have already inquired and have an account, please log in to your parent portal and refer to your child's checklist to register for a Discovery Day. Have your child spend the day with us - Plan a shadow visit. Prospective students entering grades 5 – 12 can experience a full day at Glenelg Country School prior to submitting an application. Your child will spend the day with a current student, attending classes and experiencing what it would be like to attend our school. Schedule your visit today! Contact the Admission Office at 410-531-7347 or admission@glenelg.org. Shadow visits begin in early October and continue throughout the year.